Patrick Seguin, the charismatic French gallery owner, is somewhat of an anomaly in the world of art and design: neither fish nor fowl; someone who defies categorization and surprises at every turn. Known to some as a dealer in French architects and to others as a contemporary art collector, Seguin is, to put it simply, excited about a lot of things and wants to share them all with as many people as possible. As various projects of his take shape across the globe this autumn, AD PRO caught up with the multi-hyphenate dealer in his 17th-century Parisian home to talk collecting, the genius of Jean Prouvé, and why friends are important. The gallerist Patrick Seguin. Above: A Prouvé house Seguin installed in the Tuileries Gardens in Paris. Born in the South of France, Seguin describes himself as “born in Montpellier and southern in temperament. 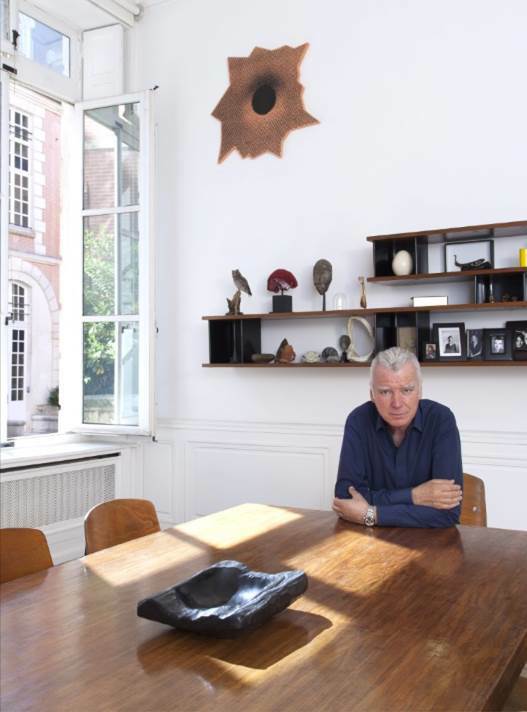 I came to Paris about 30 years ago and changed my life.” His early profession was in hospitality, but he discovered his passion for architecture and design early on and founded his eponymous gallery in 1989. Where others maintain long lists of artists they support and show, Seguin is focused on five names only. They are four architects and one designer, all French: Le Corbusier, Jean Prouvé, Charlotte Perriand, Pierre Jeanneret, and Jean Royère (the rights to whose archive Seguin owns along with his colleague, gallery owner Jacques Lacoste). “My core business is the modern French architects of the 20th century,” Seguin says. With the largest collection of demountable houses by architect Jean Prouvé (23 at last count), Seguin is on a mission to promote and share Prouvé's work and building philosophy with the world. In addition to showing pieces in his Paris gallery, Seguin also opened a London gallery in Mayfair in 2015, with a solo show of Prouvé. And he has regularly shown these Prouvé demountable houses in unexpected places—like the Tuileries Gardens in Paris and the Venice Biennale. Most recently, 12 Prouvé houses from 1939 to 1969 were shown at the LUMA Foundation in Arles, France, the largest exhibition of its kind. A Prouvé table under a Richard Prince painting in Seguin's Paris home. Prouvé furniture from the Cité Universitaire. Although Jean Prouvé is a frequently heard name in today’s art and design world, 30 years ago it was not. “I wasn’t working with a business model, but what I did with Jean Prouvé could not be done today," says Seguin. "In 1992, we bought 450 chairs and 87 tables by Prouvé from the Cité Internationale Universitaire de Paris [student housing]. We also bought 76 student rooms from the Maison du Brésil, also in the Cité Universitaire, all designed by Perriand and Le Corbusier, which included beds, light fixtures, etc. At that time, there were a few people at the flea market who had a few pieces, but not many." Seguin’s approach is pedagogical and he has edited more than 20 books, the majority on Prouvé. "These books are one of my main activities," says the dealer. The third boxed set of Prouvé books will be out in January 2019. A Prouvé-designed room from the Maison du Brésil owned by Seguin. An essential part of Seguin’s work in supporting, sharing, and promoting the work of these French architects and designers is, of course, providing a platform for bringing this work to a wider public and making it all relevant today. "Prouvé was a humanist, a philanthropist," Seguin says. "He felt industry was necessary and he prefabricated houses ready to build and ready in one day. Many of his houses were built as emergency houses." This need for emergency housing that addressed issues of the homeless and displacement is not lost in today’s world. Indeed, Seguin's continued relevance may well be in his commitment to looking forward, even while he continues to champion Prouvé's historic work. Never one to stand still, Seguin has multiple projects going on, for now and the near future. One of his initiatives is an annual invitation to an international art gallery to show in his Paris gallery, called Carte Blanche, during the FIAC art fair in October. This year he has invited L.A. gallerist David Kordansky, who will be showing American artist Will Boone, another creative who defies classification, much like Seguin himself. The show will be Boone's first solo exhibition in Paris. A Prouvé house Seguin installed at the LUMA Foundation in Arles. Seguin will also be showing another Prouvé house on the Place de la Concorde this fall as part of the FIAC Hors Les Murs program, showcasing art in open-air locations around the city. Additionally, Seguin adds rather modestly, “I am building a house in the South of France on about 111 acres. This is a project of a lifetime…with my good friend, Jean Nouvel.” Pritzker Prize–winning architect Nouvel also renovated Seguin’s Paris gallery (stay tuned for the results). In the meantime, when asked what kind of advice he would give to young collectors, he says, “If you want to collect art, don’t be lazy…this takes a lot of time. See the most shows, read books, meet artists.” And what in particular would you suggest someone collect? “Richard Prince books. This is something to collect. He is one of the most amazing living artists.” And a good friend.